Silverlit Heli-Mission RC SWAT Truck Hides An RC Helicopter In The Back | OhGizmo! Since the dawn of time man has had to make the difficult and agonizing choice of playing with an RC car or an RC helicopter. And while many great minds from philosophers to engineers have racked their brains trying to find a resolution to this problem, it was a toy company that seems to have come up with a happy medium allowing us to finally enjoy both at the same time. The Silverlit Heli-Mission SWAT Truck is a fully functional RC car that includes sirens and flashing lights, but the real star of the show is the cargo bay which opens to reveal one of the company’s micro helicopters hidden inside. The launch platform even rises allowing the whirlybird to take off so you can continue your imaginary police pursuit from the air. 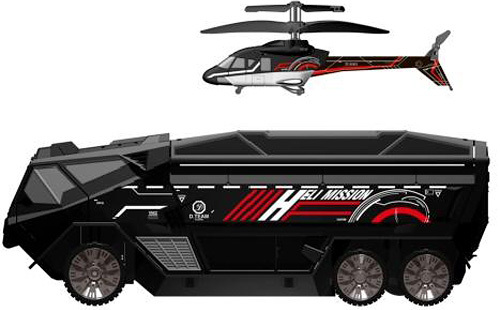 The Heli-Mission SWAT Truck should be available sometime in July for about $100, and I have to assume the included remote does double-duty for controlling both the helicopter and the truck. Cool Toy. Thanks for sharing. I think this is a kind of mini rc helicopter in mission.